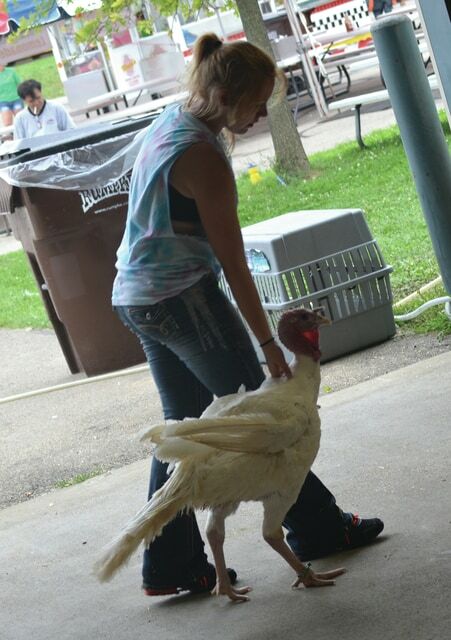 While Greene County Fair attendees won’t witness scenes like this one from the 2014 fair, local youth will still be able to show and sell their birds this year, but with a twist on the normal procedures. XENIA — While live birds won’t be at the Greene County Fair this August due to a statewide ban on poultry shows, local fair officials have come up with an alternative option to allow kids a chance to show and sell the animals they raised this year. The Greene County Agricultural Society recently approved an alternative to live bird showings through poster displays and interviews. Exhibitors will show posters with a picture of them with their bird as well as a written statements about their project and will be interviewed by a judge as a portion of their final scores. Posters (40 percent), skill-a-thons (30 percent) and book checks (30 percent) will make up scores that will determine champion exhibitor. Project sales will continue as normal. For more information about specific changes and project deadlines, contact OSU Extension Greene County at 937-371-9971. The changes come after the Ohio Department of Agriculture officials announced a ban earlier this month on all live bird exhibitions around the state, including bird displays and shows at the Greene County Fair. The ban comes as an effort to protect against the spread of avian flu. No cases of the bird flu have been reported in the state, and the ban was meant as a means to maintain that status. The bird ban includes county and independent fairs, the Ohio State Fair and all other gatherings of birds for show or for sale, including auctions and swap meets. The bird flu has forced other poultry-producing states such as Iowa and Minnesota to kill millions of birds to prevent the spread of the disease. According to United States Department of Agriculture data, more than 44 million birds have been affected by the disease nationwide. According to the ODA, Ohio is the second largest egg producer in the country and home to 28 million laying chickens, 12 million broilers, 8.5 million pullets and 2 million turkeys. Ohio’s egg, chicken and turkey farms are responsible for more than 14,600 jobs and contribute $2.3 billion to the state’s economy. Ohio’s cancellation of bird shows followed other states which have made similar moves for the 2015 fair season, including Indiana, Pennsylvania, West Virginia and Michigan.